South Gallia senior Nick Hicks (14) goes in for a layup, during the Rebels’ win over Federal Hocking on Dec. 14, 2018, in Mercerville, Ohio. MERCERVILLE, Ohio — Somewhat of a balanced approach. 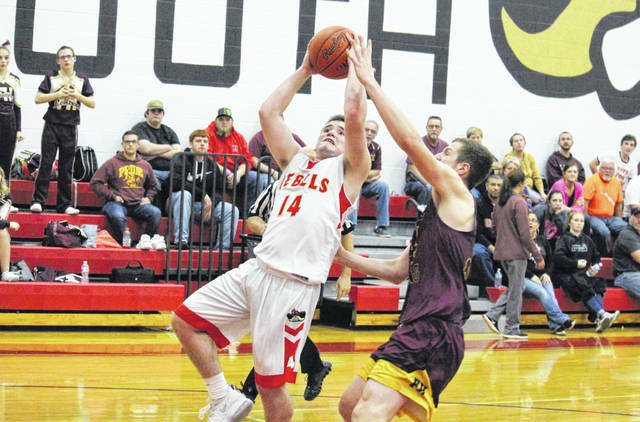 The South Gallia boys basketball team had four players reach double figures and led by double digits at the end of all four quarters on Friday night during a 63-40 victory over visiting Wahama in a Tri-Valley Conference Hocking Division contest in Gallia County. The host Rebels (10-4, 6-3 TVC Hocking) received a career-high 24 points from Nick Hicks, who poured in eight of those during a 21-8 first quarter surge that ultimately set the tone for the evening. Hicks added another eight points in the second frame as part of a 22-12 charge that firmly put the Red and Gold in control with a 43-20 cushion at the break. The White Falcons (2-11, 2-7) managed to make things interesting with a 17-6 run that whittled the lead down to 49-37 entering the finale, but SGHS ended regulation with a 14-3 run — including a perfect 6-of-6 effort from Hicks at the free throw line — to wrap up the 23-point triumph. South Gallia — which has now won eight of its last 10 decisions — also claimed a season sweep after posting a 64-34 decision at Gary Clark Court back on Jan. 4. The Rebels made 21 total field goals — including five 3-pointers — and also went 16-of-19 at the free throw line for 84 percent. Hicks nailed two field goals, four trifectas and went 8-of-8 at the foul line en route to his game-high tally. Garrett Saunders was next for the guests with 12 points, while C.J. Mayse and Braxton Hardy respectively chipped in 11 and 10 markers. Jared Burdette and Kyle Northup completed the winning score with two points each. The Red and White netted 14 total field goals — including a pair of trifectas — and also went 10-of-11 at the charity stripe for 91 percent. Abram Pauley paced the guests with 12 points, followed by Jacob Lloyd with nine points and Jacob Warth with six markers. Dakota Belcher and Brayden Davenport respectively added four and three points, while Jonathan Frye, Adam Groves and Cooper Peters each contributed two points in the setback. South Gallia hosted Ohio Valley Christian on Saturday night and returns to action Tuesday when it heads to Belpre for a TVC Hocking contest at 6 p.m.
Wahama hosted Ravenswood on Saturday and returns to action Tuesday when it welcomes Federal Hocking for a TVC Hocking contest at 6 p.m.